I work very early on Saturday mornings. I am up at 4:30 AM to be behind the mic at 5 AM. Sometimes I neglect to pack breakfast. At that early in the morning, it is easy to rationalize sleeping five more minutes, instead of preparing for the inevitable hunger later on. If I am with it, I make something the night before, to grab on my way out, which is exactly what I did last night. Now, I warned you all in the beginning that some of these sandwiches might not be palatable to everyone. This sandwich is the first of those types of creations. Today’s sandwich is Nutella, peppered Bacon Salt, on an Arnold Sandwich thin. I know…kinda gross, but I really like it. I obviously don’t eat bacon, but I always was intrigued by chocolate covered bacon, so this was inspired by that idea. 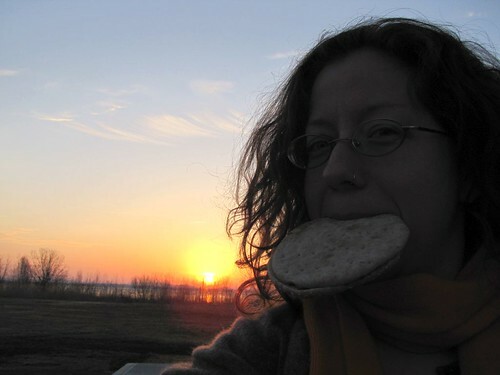 FYI, it is incredibly hard to take a self portrait with a sandwich in your hand, so I put it in my mouth instead. Not the most flattering photo of myself, but funny nonetheless. The weather here is going to be lovely this weekend, so locals, I hope you can get out and enjoy it. sweet and Salty..I could do it!